Choosing a new bathroom design for the entire family can be both a daunting and exciting experience. 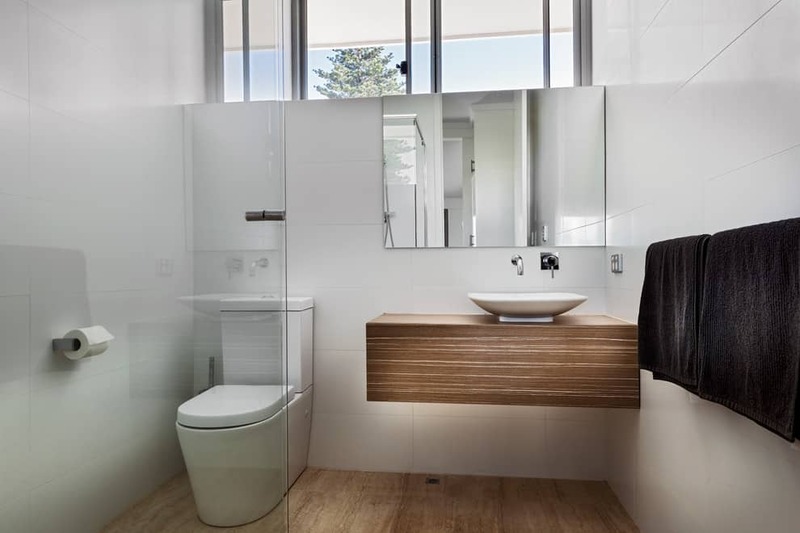 Whether you are revamping parts of the bathroom or going for a totally different bathroom design altogether, there are a lot of possible bathroom renovation ideas you can to think about and consider. But worry not, this article is a simple step-by-step guide to completing a bathroom renovation, big or small. No matter the size, style, or scope of your bathroom renovation project, you will find what you need to know right here. As you go through the steps below, you will discover a lot of helpful ideas and tips to move through the remodeling process. Some of it may be familiar, while other points will be brand new. Throughout the whole process, I’ll tell you exactly what you need to know. I’ll help you to decide how and where to start. I’ll also show you how to maximize space and small bathroom ideas to make it look bigger than it actually is. These ideas are true game changers. Grout is falling in the tiles. Things like caulking are turning yellow. There is mold and mildew crawling on your walls. Your bathroom is just too small. The bathroom is hopelessly outdated and needs to be brought into the twenty-first century. You are considering the possibility of selling your home. Your needs have changed with major life events: marriage, a new baby, elderly parents moving in, etc. These are just a few of many important occurrences that you might need to consider. Your bathroom is just, well, not you. If you feel your bathroom just doesn’t reflect your style or personality, it is probably high time to consider some new bathroom decorating ideas! Do you simply need new bathroom fittings, accessories and a new coat of paint? What is the current situation in your bathroom? Can you attack the grime and mold with some bleach instead of replacing all existing fittings with brand new bathroom sinks, vanities, tile, and tubs? Is there another bathroom in the house or does the entire family use the same one? In such cases as these, it might help to have a separate area for the toilet and shower, away from the rest of the bathroom. This way, someone can still use the vanity and mirror while another person hops in the shower. Who will be using the bathroom? Consider each person’s gender, height, and age when buying bathroom furniture and decorations. How much money can you realistically set aside for your bathroom project? If you are selling the home, you might not want to spend too much since you will not be using the bathroom, unless, of course, it will help you increase your home’s value. That’s always a good decision! A bathroom, no matter how big or small it might be, should function as an area for contemplation, luxury, comfort, as well as functionality. If you feel your bathroom has been wearing a tired look lately (or if you are going for a complete redesign), it is time to take a look at the current bathroom trends. Timber is stronger than ever when it comes to finishes. But, this year bathroom timber veneers will come with a twist in that you will see refined, crafted and engineered options. This gives you many choices from which to pick your favorite style. Textured timber is even more popular than before. Think walnut and chestnut finishes if you are wanting to depict warmth and create a constant reminder of nature and natural elements. Stone is a key feature of this year’s bathrooms. Natural, raw or finished, engineered stone, slabs, and tiles can recreate the luxe look of expensive marble. This is an important trend in bathroom flooring and could be the perfect fit for your home. While metallic finishes in gold, rose gold, copper, pewter, and brass were popular in 2014-15. In 2016, we see a new addition – rust. 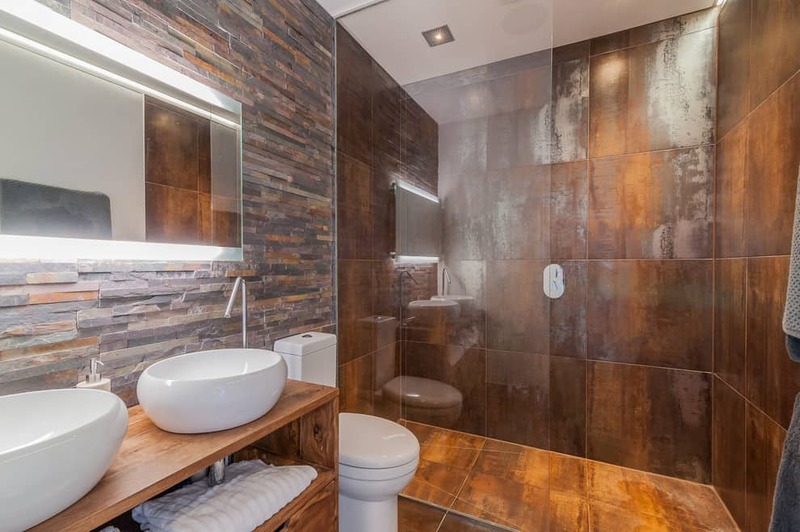 The metallic rust colored look will be seen not only on hardware and plumbing fittings but also on wallpapers, paints, and tiles for creating a rustic down to earth look. This stylish patina only grows more refined with time. This is one of the highly popular bathroom decorating ideas which can be as low key or high end as you like. This means you could incorporate a simple lily on the windowsill or go for an entire wall of succulents featuring one large glass panel. 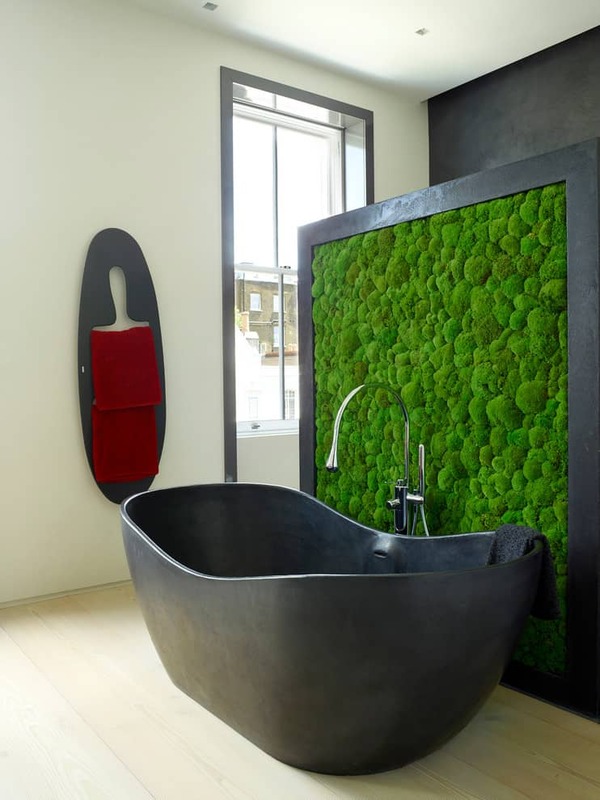 A living wall in your bathroom can bring the lavish experience of a hotel right to your home. Thinking of replacing your bathroom tiles? Blue has been going strong as far as the popular colors for bathrooms for the past 5 years. This year though, you can expect to see Indigo and Ink blues which are warmer shades of Blue. Also, white is a popular color in tiles for bathrooms, but you can expect to see it trending to greener bases rather than grey or beige. Think of lighting that adds soulful warmth to your small space. LED lights in negative detailing can help flood a wall or accessory to create interest and texture. Your bathroom is your sanctuary-a place where personal intimacy is cherished and time can be spent reflecting upon self. Redesigning your bathroom to create more space requires a marriage of form and function, aesthetics, and comfort. Think about first impressions when planning the bathroom layout. You do not want your toilet to be in direct line of sight of the doorway. One of the best small bathroom vanity ideas is to have one that is wall-mounted. This can greatly maximize your space. You can have a heated towel rack or rail right next to the entrance of the shower stall. Such bathroom shower ideas are best implemented with an electrician’s help to ensure the rail is in an electric safe zone. Add plants and greenery to instill life in the design. If you are upgrading the entire bathroom, make sure you account for plumbing points. If they need relocation, it might increase your budget cost considerably. If you love clean lines, one of the best small bathroom storage ideas that does not clutter the room is adding recessed mirror cabinets. Just make sure you select ones that fit the depth of the bathroom wall cavity. One of the most important bathroom accessories are your lights. You should try to use as much natural light as possible. Arrange to have your mirror such that it lets you see your reflection in natural light. 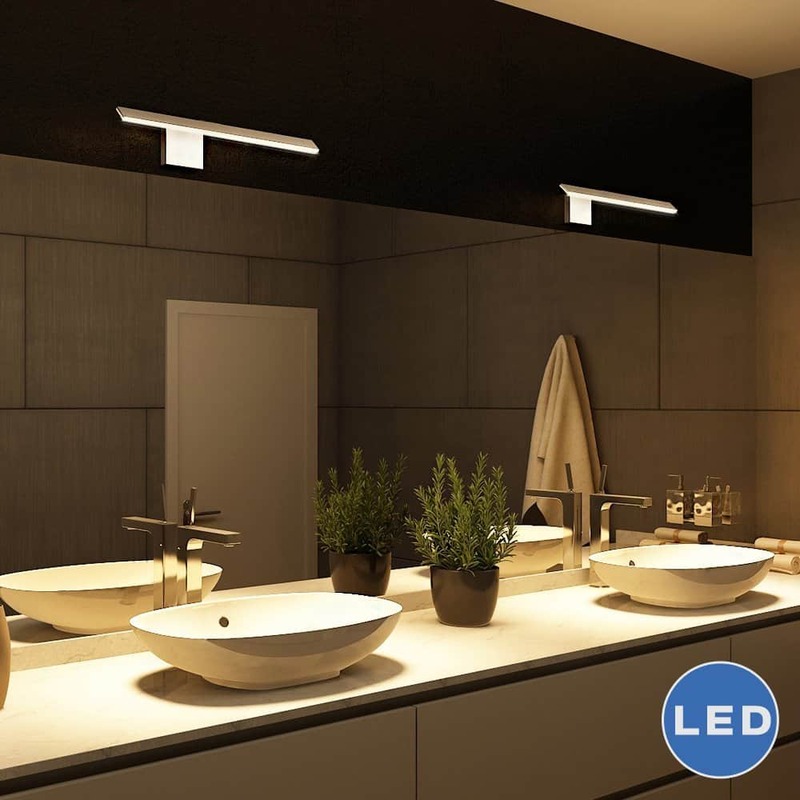 You can choose LED recessed lights which help save energy and the hassles of changing light bulbs every now and then. Do not go for overly bright or white light as it can over-saturate the space. One of the best ideas for a bathroom’s lighting is to select a shape you want to accentuate the most. You can start with the bathroom sinks. Square sinks with rounded edges are one of the most popular designs in basins. You can later extend to choosing the shape of your mirror and bathroom cabinets. For a walk in shower, choose a shower mixer that is readily accessible from outside your shower entrance. This way, you do not get drenched in cold water when accessing the mixer. Stick to a single brand especially when selecting your fittings and accessories. This will help you keep the same shade of all your fixtures and keep a look of uniformity. 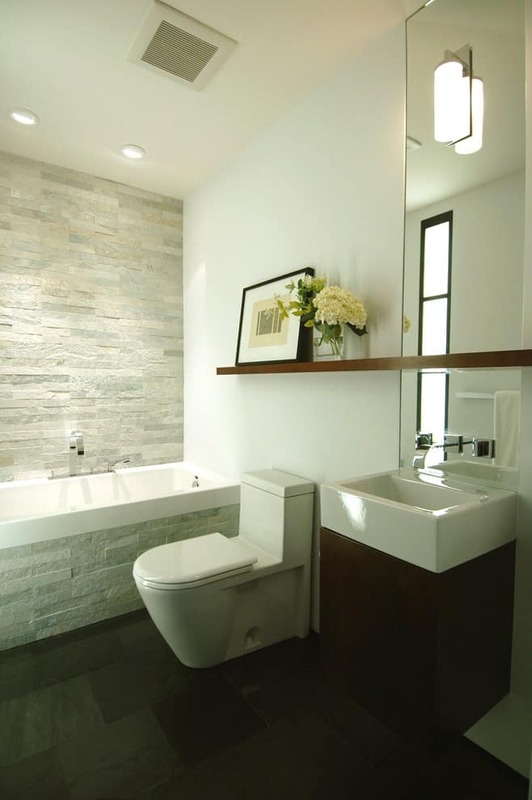 If you have a small space, then a great small toilet idea is to do an in-wall cistern. The water tank is in the wall, so you will need to ensure there is adequate room in the wall cavity for the waste outlet through your flooring. Choose bathroom cabinets with mirrors having demister. Demisting Bathroom Mirrors ensure you have a crystal clear reflection when you get out of the shower. You can also go for glazing protection to maintain the life of glass and enhance appearance. For budgeting purposes, always note what bathroom accessories come with your selected products. For example, some bathroom sinks and vanities do not come with waste, bottle trap or overflow covers. So check with your plumber or builder as to what bathroom accessories you will need. Instead of traditional heating, go for under-floor heating elements. These are great because they keep your feet warm on the usually cold tile floors. If you have already chosen your tiles and bathroom color schemes, then take the tile and your color swatch along with you to the home store. You can use them to make the right choice when you pick your bathroom vanity. 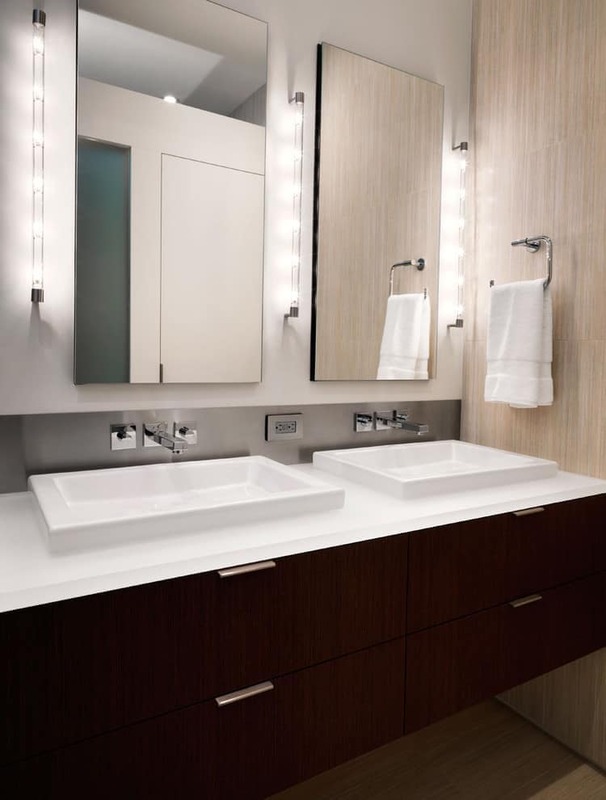 You can maximize your space by choosing mirrored small bathroom cabinets. These can give you much needed extra storage and also accommodate your daily beauty regime. If you are having your vanity custom built, just remember that it takes a lot of extra time. To avoid delays, get this part started at the beginning of your makeover project. This will help avoid complications and delays. If your vanity is going to be hung on the wall, ensure there is adequate support built in for this purpose. If you have tall/short people in your family, take their height into account when mounting the vanity. Make sure that the design, height, finish, and function of the vanity suits everyone who uses the bathroom. Some bathroom furniture designs come with traditional doors, or drawers, or doors-AND-drawers styles. The drawers can be small or deep enabling bottles to be stored vertically. Take all these ideas into account when selecting your design. 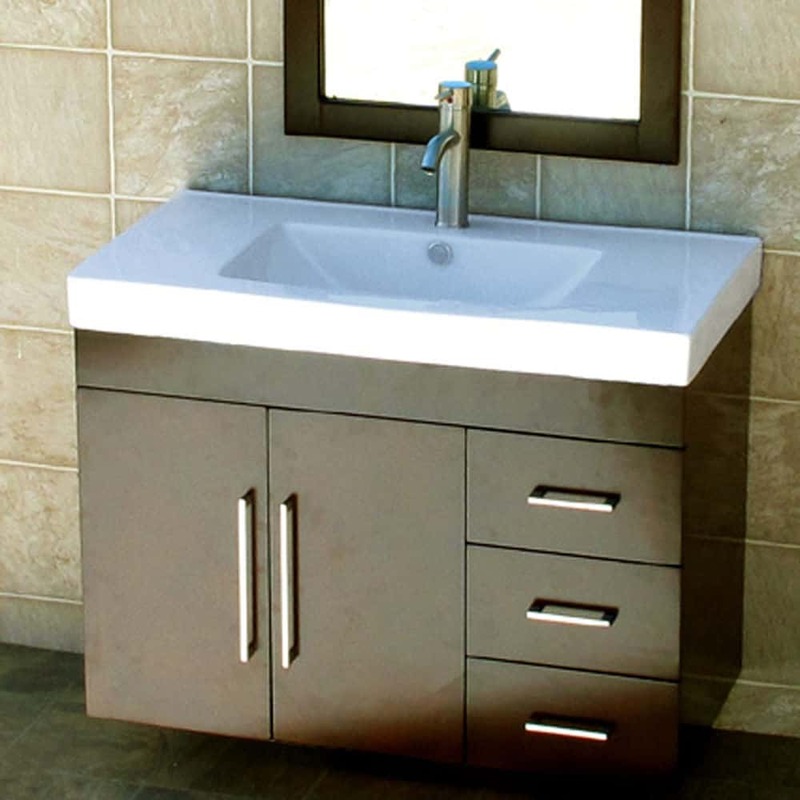 Vanities come in various materials and finishes. You can select bathroom sinks built into the vanities. The sinks and tops can me marble, porcelain, or other composite materials. Bathroom cabinets also come in a wide range of materials like Melamine, wrapped foil, polyurethane, or glass. One of the most common mistakes made by both professionals and homeowners during a bathroom remodel is inadequate planning. Some crucial basics are often forgotten. For example, many people fail to take existing plumbing and electrical wiring into account. Also, don’t underestimate costs. If you are altering existing flooring, sunken fixtures, walls or ceiling, you will need extra time, materials and money. So make sure you estimate costs accurately and seek the help of specialty contractors. Remember that all the costs can add up quickly, so be sure to keep yourself in check when taking on a bathroom makeover. I hope you found some useful tips here. Please reach out in the comments below if you need any clarification or advice. Good Luck! I’ve been wanting to redo my bathroom for about a year now, but I’ve been struggling to come up with ideas. I didn’t realize that blue was still a popular color for tiles. I really like the blue tiles in the picture you shared. I feel like a colorful tile wall would do wonders to make my bathroom more refreshing. Thanks for the ideas! Thanks for posting these awesome tips and amazing pictures. I have already set a budget, and am working on planning a layout with what I want for my Bathroom. I am currently deciding if I want to hire a contractor, or attempt to do it alone. I think that I won’t have enough time to invest into the project so that I will try to start it alone, and end up hiring someone anyways. Thanks for the help! No problem. Good luck with your project! This is for sure a great selection of ideas and concepts! Thank you! Thanks for pointing out that you should determine your goals for an updated bathroom such as new fittings, accessories, and new coat of paint. You also mention considering if other people use the bathroom as well, or just you. I think it’s important to have a solid picture of your dream bathroom in your head so that you can properly convey that message to the contractor. As soon as you determine your goals, this is where you can start planning. You have to know what you wanted to do with your bathroom so that you have a vision of what it will look like. My husband and I are looking forward to remodeling our bathroom. We want to make sure we are making the right design decisions as well as finding the right contractor to help us. These are some great tips for the remodeling process. I hadn’t thought about making sure that the height of the vanity would be functional for all who use it, but that’s important to check. Following these steps will make your bathroom a haven. Thanks for this post. You have a ton of great bathroom remodeling ideas. 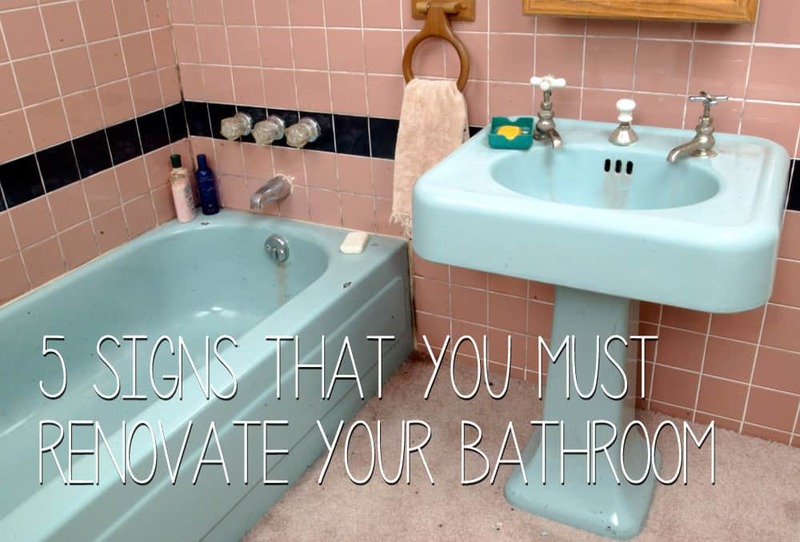 The third reason you listed, being hopelessly outdated, is definitely our bathroom’s problem. It looks like the room walked straight out of the 70’s, and I hate it. We need a remodel! I loved your tip to consider my goals before undergoing a renovation in my bathroom. This seems like it would also be a good time to set a budget so that you can go on to plan the details of how you’ll accomplish your goals without overspending. My wife and I will definitely spend a lot of time in this phase so that we can ensure our bathroom renovation goes exactly as planned according to our wants. Thank you for the 7 steps for a successful bathroom renovation. 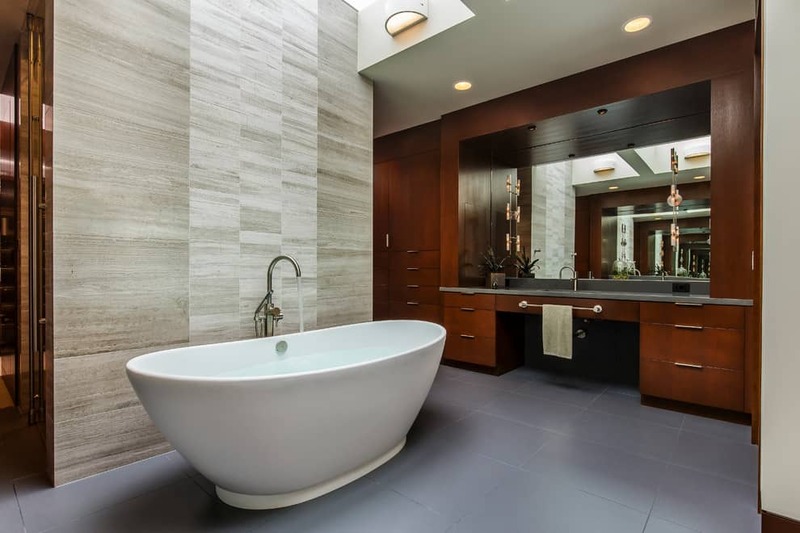 I definitely like the idea to consider your needs and goals for a bathroom remodel. This helps you set a budget and design your idea around that budget. I love the look of the black stone tub with the living wall behind it. The moss feeds of the moisture in the room if I’m not mistaken so upkeep is extremely minimal. Nice post! You’re right, choosing the right tiles can make your bathroom much more lively and refreshing. Thanks for the post! Your post is amazing because of its information that facts. I think this is the best blog on the bathroom renovation. Keep on posting such impressive things and helping people. I like bidet. Forget the typical toilet. Be among the first of your friends to install a bidet in your bathroom, which will solidify a completely unique appeal in the bathroom. if you like a bidet, do a bidet. Tired of living with small white floor tiles, I removed them along with the cabinets and now installing cement look large tiles and white quarts on white cab. Problem is, I retained the chrome roman tub faucet to save some money and fell in love with a modern twist on a Victorian sink faucet by Pfister. Plan to warm up the whole look with ORB light sconces and hardware. I am so happy to find this article. Make a small bathroom look remarkably bigger with neutral colors that run along the floor, up the walls and even continue onto the bath. Make sure all light fittings have the correct IP rating for safe use in wet areas. A small bathroom can be fashionable, practical and, with the right know-how, space-efficient. Thanks for sharing this. Thanks for bringing to my attention that you should figure out what you want with the layout of your bathroom. Like you said, you need to keep in mind where the plumbing points are. Otherwise, you’ll run into issues with having to adjust the plumbing, and that could be a lot of extra work. My husband and I will keep this in mind because we’re doing a bathroom remodel, and we’re thinking we’ll adjust the layout of the room. We’ll make sure to keep the main plumbing fixtures in roughly the same places, though. It is really helpful for me to know about the steps for renovating the bathroom, as I am contemplating to renovate the bathroom. I really feel thankful to you for such a wonderful suggestion. Honestly, I was so confused and searching for a long time but truly after visiting your blog, I get superb ideas. Best wishes and please keep-sharing posts. Thanks for the information about bathroom remodels! I like the idea about the lighting and latest trends. I was actually searching for these 2 topics and glad I found your blog. Very informative indeed! Another idea added on my list! By working on sections, you can complete at a much better pace and make it so you are adding value to the home for your future buyers to be impressed with. Perhaps small things do need to be changed, as your example of changing the toilet seat is really all you needed for the toilet, and is very understandable. Wow, These are dreaming bathroom remodel ideas. I exactly want to make my bathroom this way. I will bookmark this site and apply these ideas when we are shifted into our new home for making my bathroom. Thanks for the sharing such kind of fantastic design of the bathroom. Especially I love your bathroom living wall. I will do it for sure. I wanted to thank you for this advice for a bathroom remodel. 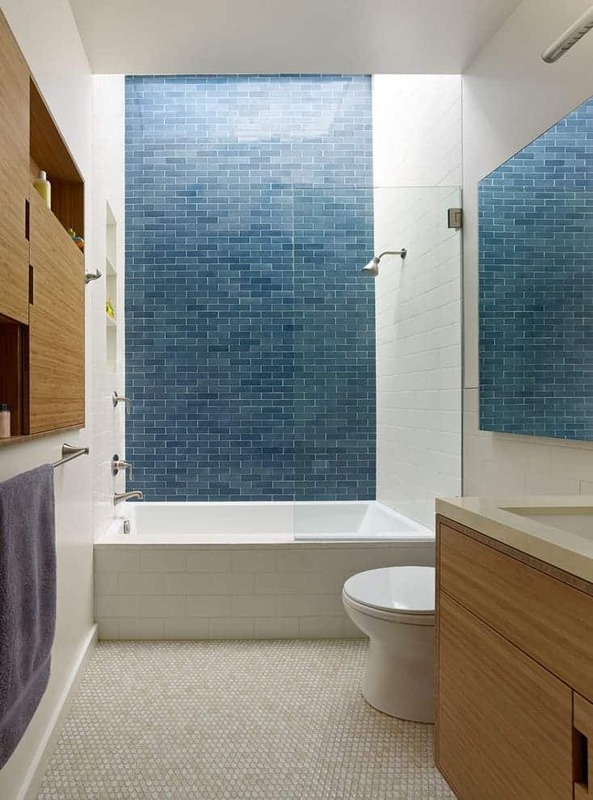 You mentioned that blue tiles are still fairly popular for bathrooms over the last five years. I’m interested to learn if this is because blue tiles are easier to make or if many bathrooms just benefit from having a hint of blue to it. Most people find that the raised toilet height makes it easier to sit and stand. But for shorter people, a raised toilet may seem a bit high. Try sitting in a desk or dining chair to see how it feels to you. A powder room is probably the best place for a comfort height fixture. You’ll have to check with the manufacturer on that. I really appreciate the use of mirrored vanity cabinets not only to liven up the bathroom but more so to make smaller bathrooms look bigger. Mom is planning to have the condo bathroom revamped for size, and this I think is a good idea to match her baroque tiles concept. I’d suggest she get good bathroom remodeling services to realize this design for her.